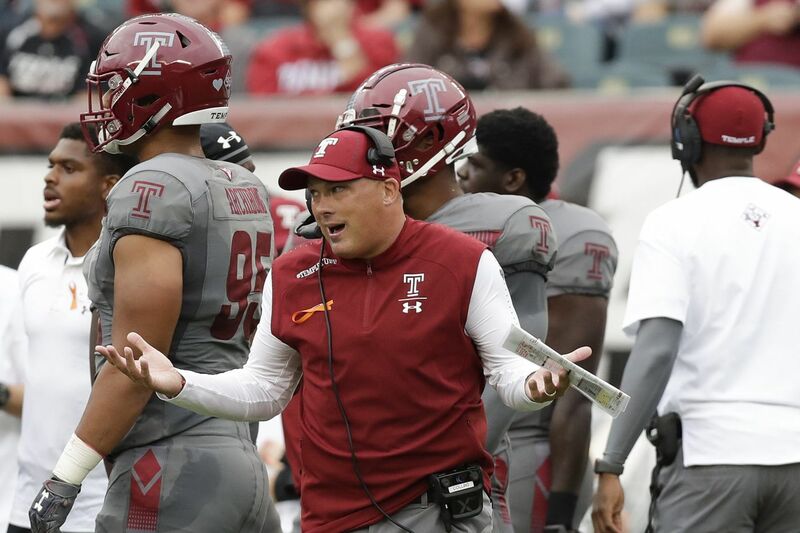 Temple football coach Geoff Collins said he isn't sure whether two injured Owls, defensive end Quincy Roche and kicker Aaron Boumerhi, would be able to play in Saturday's game at Maryland (2-0). He said he would know more after consulting with doctors. Roche, the Owls' most effective pass rusher, suffered an unspecified injury during the second quarter of Saturday's 36-29 loss to Buffalo at Lincoln Financial Field. He returned to play in the Owls' last two series. Boumerhi didn't see any action after missing a 40-yard field goal in the second quarter. He was replaced by Will Mobley. After the game, Collins said Boumerhi was suffering from a hip injury. "Hopefully, they will be back this week," Collins said Monday during the American Athletic Conference's conference call. Also, Temple (0-2) doesn't appear to have a quarterback controversy yet, but the heat could be on starter Frank Nutile, who hasn't played with the same effectiveness as he did last year when he went 4-2 after taking over as the starter. In losses to Villanova and Buffalo, Nutile has completed 33 of 63 passes for 401 yards, four touchdowns and four interceptions. Against Buffalo, reserve quarterbacks Anthony Russo and Todd Centeio played in two series together, with Centeio serving as a running back. Russo completed 2 of 4 passes for 24 yards. Asked if Russo or Centeio was taking first-team reps this week, Collins laughed then said, "Frank Nutile does a great job, and Frankie Nutile will win us a lot of ball games the way he did last year." The Owls are a 14 1/2-point underdog to Maryland, which has wins over Texas and Bowling Green.